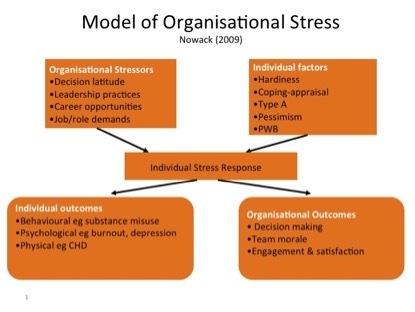 We see managing stress at work as a function of effective leadership. The leader has a significant role to play in terms of delegating autonomy, supporting followers, providing role clarity, being inclusive about change and promoting positive relationships. We see managing negative emotions such as stress, as a subset of managing emotions effectively at work which is in turn a function of leading self effectively. Of course some environments are toxic and should be identified as such. Consequently both individual and organisational factors should be assessed. Whereas traditional stress management often orientated people away from sources of pressure, we believe that enhancing the skills necessary to cope with the challenge is the more constructive approach that increases the individual's sense of mastery over their environment. © 2015 CSA Consulting. All Rights Reserved.